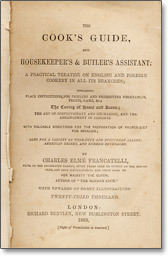 Welcome to the Cook's Guide a site brimming with historical recipes and household management wisdom imparted by a celebrity chef of his time Charles Elme Francatelli. Inside the online version of Francatelli's 1861 best seller you'll find forty chapters of genuine Victorian era recipes written in the words of a famous Victorian chef, and covering everything from the Stock Pot to Entrees, Pastries to Libations. In his book Francatelli includes a series of Bills of Fare for every month of the year in English and French. Fillet of soles à la Tartare. Braized ham à la jardiniere. Salmis of pheasants à la financière. Sweetbreads à la St. Cloud. Mutton cutlets a la vicom.